All Nets & Netting To remove debris and prevent debris from entering your pond, cover netting and handled nets are a must for any pond owner. We offer a wide selection of netting, fish and skimmer nets for the most conscious of all pond owners. Laguna Protective Pond Netting protects valuable koi and goldfish from predators, plus it keeps leaves and other debris out of the pond - protecting submerged circulating pumps from becoming clogged and reducing overall pond maintenance. The black netting material blends naturally in the water garden and comes complete with ground stakes to secure it in place. Blends easily with your environment. Aquascape Protective Pond Netting effectively keeps debris and predators from entering ponds, waterfalls, and other water features. Keeping leaves and other debris out helps keep them clean, clear, and healthy. The quality woven poly material resists tearing and the reusable design allows the netting to be installed year after year. Comes conveniently rolled, making it simple and easy to install. Included U-shaped stakes keep the net securely in place. Catches falling leaves and other debris before it enters your pond. Protects valuable fish from cats, birds, and other predators. EasyPro Boxed Premium Pond Cover Netting in bulk! 100′ long bulk netting allows you to simply pull out the length needed, cut it and go – you have a cover net exactly the length you want. Perfect for large ponds, streams and waterfalls. Standard mesh is 3/4″ polyethylene woven netting. 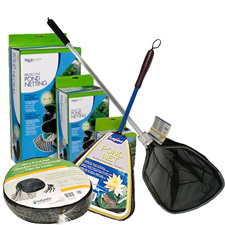 The Atlantic Pond and Garden Protector makes an ideal instant line of defense against many types of predators including osprey, hawks, herons, egrets, kingfishers and raccoons. Once assembled it can easily be moved by one person, handy for immediate deployment or easy access to your water feature. Can also be used in your garden to protect fruiting plants and vegetables. Mesh opening allows for sunlight and optimum plant ventilation. Aquascape Collapsible Fish Net Coarse Mesh 17.5"
The Aquascape Collapsible Pond Net is able to extend from 20" to 30", getting the job done in areas where many nets may not be able to reach. This collapsible pond fish net includes a quick-latch, telescoping handle that is able to completely fold down for compact storage. The plastic grip and lightweight frame help to maximize maneuverability, and the nylon loop on the handle make it easy to hang. The 17" wide coarse, tangle-free mesh glides quickly through the water making it an ideal net for catching and handling fish. Aquascape Skimmer Net Collapsible White Fine 17.5"
The 17" wide fine, tangle free skimmer net catches even the smallest debris, making it ideal for quick and easy removal of leaves and other debris. The quick-latch, telescoping handle extends to 35" and completely folds down for compact storage. Aquascape Heavy Duty Nets with Extendable Handles are a durable pond net designed for general maintenance and handling pond fish. The soft, coarse mesh prevents damage to fish fins and scales. The durable, heavy duty construction net allows for removal of large amounts of debris, significantly cutting down on maintenance. A protective bottom strip prevents net damage during use to maximize the lifespan of the net. The extendable handle makes it easy to skim those hard-to-reach areas in your pond by extending from 36-inches to 69-inches. A rubber grip and lightweight frame maximize maneuverability and the nylon loop on the handle makes it easy to hang for storage. Net Dimensions: 15.5" x 16"
Handle Length: 36" - 69"
36" long, extends to 69"
36" long, extends to 63"
Great for tight spaces or ideal for children to lend a helping hand. Pond nets are used for catching fish and general maintenance. Our multi-purpose pond nets are ideal for removing fish or debris from the pond. The super soft netting will not damage the fish or and is easy to keep clean. Soft fine mesh is great for skimming or removing leaves or fine debris. Great for Jr. pond explores. These nets have a unique triangular head, allows easy access to round corners and is collapsible for easy storage. Head size is approx. 18" x 16", the handle is telescoping to 32". Skimmer Net: Has tiny holes which is used to catch smaller debris. Pond Net: Has larger holes which is used to catch bigger debris and catching fish. The Laguna Pro Pond Skimmer and Pro Pond Net are a heavy-duty net featuring a rigid, extendable shaft and soft, fish-friendly netting. The net frame has a tear-resistant plastic guard that prevents the net from tearing due to constant contact friction. Both nets also features a non-slip handle and hanging string for convenient storage. AquascapePRO® pond nets are designed and built for professional pond maintenance crews. Heavy-duty 3-foot handle collapses for storage, allowing the net to be safely transported from one pond to the next. Professional Grade Pond & Fish Net is great for removal of large fish and a variety of debris. Soft coarse mesh will not damage fish fins and scales. Lightweight and durable frame and handle. Protective strips prevents net damage. The Aquascape Pro Fish Net with Extendable Handle is perfect for handling pond fish. The soft, coarse mesh and shallow-design effectively prevents damage to fish fins and scales. Heavy duty construction and large net head makes it compatible with larger koi. The extendable handle makes it easy to skim those hard-to-reach areas in your pond by extending from 38" to 72". A rubber grip and lightweight frame maximize maneuverability and the nylon loop on the handle makes it easy to hang for storage. Ideal for large fish including koi. Shallow design cradles large fish without snagging. Laguna Pond Nets have a wide variety of features that make maintenance in and around ponds very convenient. This net has a 33 centimetre (13 in) aluminum shaft for arms-length tasks. A slip-resistant handle helps ensure a good grip when your hands get wet. The net frame has a plastic guard that protects the net from tearing due to friction. The frame has rounded corners for access to hard-to-reach places. The soft netting is fish friendly. The pond net comes complete with a hanging string for easy storage. The Aquascape Mini Pond Net is suited for smaller hands and ideal for exploring the pond for frogs, smaller fish, and other critters. Reducing debris levels in ponds and other water features will improve water quality and decrease maintenance needed throughout the year. Its soft, coarse mesh is able to effectively retain debris but will not damage fish fins and scales. The lightweight design and rubber-coated handle makes the net easy to maneuver. Laguna Mini Pond Net and Pond Skimmer are ideal for those delicate fish-handling tasks or small water gardens. Handle extends from 14" to 24"